The Barron County Sheriff’s Department said on its Facebook page that Jayme Closs has been located. Undated file photo provided by Barron County, Wisconsin, Sheriff's Department, shows Jayme Closs. A 13-YEAR-OLD northwestern Wisconsin girl who went missing in October after her parents were killed has been found alive in a rural town about an hour from her home. The Barron County Sheriff’s Department said on its Facebook page that Jayme Closs has been located and that a suspect was taken into custody. Sheriff Chris Fitzgerald said Jayme was expected to be reunited with her family last night night. Fitzgerald said authorities in Douglas County, about 70 miles north of Barron County, located the girl. The Douglas County Sheriff’s Office confirmed on its website that Jayme was found in the Town of Gordon at 4.43pm, and that a suspect was taken into custody 11 minutes later. Neither statement gave any further information about the suspect. Jayme’s grandfather, Robert Naiberg, told the Minneapolis Star Tribune that Jayme was being treated at a hospital. Sue Allard, Jayme’s aunt, told the Star Tribune that she could barely express her joy after learning the news last night. “Praise the Lord,” Allard said between sobs. It’s the news we’ve been waiting on for three months. I can’t wait to get my arms around her. I just can’t wait. The Barron County sheriff’s office plans to hold a news conference this morning to discuss the case. Gillian Drummond, a spokeswoman for the Wisconsin Department of Justice, and Leonard Peace, a spokesman for the FBI in Wisconsin, declined to comment yesterday evening. Both agencies have been involved in the search for Jayme. Jayme had been missing since her parents, James and Denise Closs, were found shot to death on 15 October in the family’s home near Barron. Investigators said Jayme was quickly ruled out as a suspect. Detectives pursued thousands of tips, watched dozens of surveillance videos and conducted numerous searches in the effort to find Jayme. Some tips led officials to recruit 2,000 volunteers for a massive ground search on 23 October but it yielded no clues. Fitzgerald said in November that he kept similar cases in the back of his mind as he worked to find Jayme, including the abduction of Elizabeth Smart, who was taken from her Salt Lake City home in 2002, when she was 14 years old. She was rescued nine months later with the help of two witnesses who recognised her abductors from an America’s Most Wanted episode. “I have a gut feeling she’s (Jayme’s) still alive. I’ve always been a glass half-full kind of guy,” Fitzgerald said at the time. The Town of Gordon lies about 40 miles south of the Lake Superior shoreline and 65 miles north of Barron, where the Closs family lived. Gordon is home to about 645 people. The area is heavily forested. Logging is the top industry in the region. “A lot of people were very concerned, did a lot of praying and all that,” he said. Prayers were answered, for finding her, anyway. Resident Kristin Kasinskas told the Star Tribune that a neighbour waking a dog knocked on her door yesterday afternoon. Standing with her was a skinny, dirty girl with matted hair, wearing shoes too big for her feet. 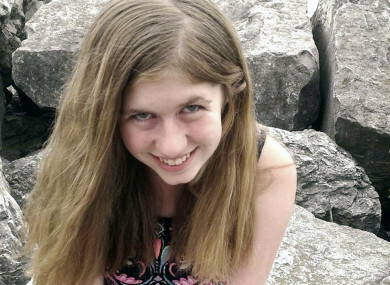 “This is Jayme Closs! Call 911!” the neighbor said to Kasinskas. Jayme was quiet, her emotions “pretty flat,” Kasinskas’ husband, Peter, said. The woman who found Jayme asked the newspaper not to use her name. Email “13-year-old girl who went missing after parents were killed in October found alive hour from her home”. Feedback on “13-year-old girl who went missing after parents were killed in October found alive hour from her home”.